A startup company Cola has today launched a messaging app for iOS users with a simple moto “Text less. Do more”. So, it is an app for easier messaging and with more interactive text. 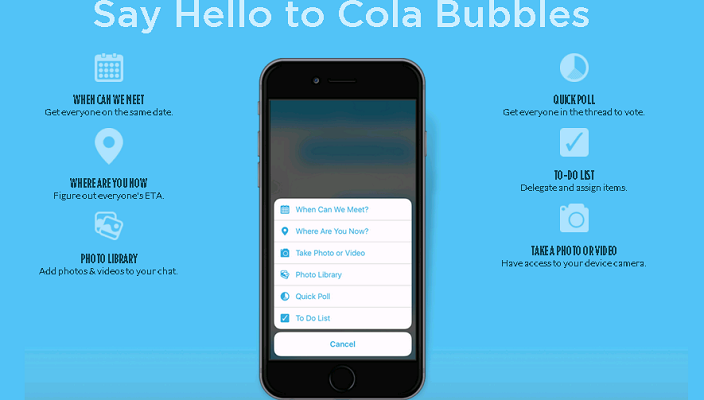 The best feature this app provides is “Cola Bubbles” as one interactive Cola Bubble does the job of more than 10 – 20 messages. Cola Bubbles helps to you keep things simple and makes everything easier such as coordinating tasks, making decisions with options and scheduling a meeting. So instead of texting someone “Where do you want to have lunch today” you can just send your friend group a Bubble like “Quick Poll for voting and making decisions”, they can vote and choose the options that they like. The meeting can be added to the calendar and give you option to share your location with your friends for 15, 30 or 60 minutes to let them know where you are and how much time it will take you to arrive. All these features are available in the Cola app so you don’t need to jump in and out to other apps. Cola app uses GPS if you choose the option to share your location. So, continued use of GPS as it is run in the background can dramatically decrease battery life. Cola app is available for free, with plans to charge for premium features. While Cola uses SMS to register your account only iPhones with US phone numbers can register for this service. You can download the iOS Cola App from Apple Store.